Halloween season with small kiddos ensures that one of the big items on my family’s October to-do list is picking out the perfect Halloween costumes. It is always a tough process for me. Finding one that fits them just right, will stand up to the weather (Halloween can be cold in Iowa), and works for school classroom parties. I usually end up at Target or Wal-Mart with the boys encouraging them to jus t pick something! Margo Tamblyn, the protagonist in this book, would be shaking her head in horror at me. Margo and her father own a costume shop, Disguise DeLimit. Margo is an interesting main character. The book is written from her perspective. She self-identifies as being shy and reserved. Yet she has no problem dressing in costume everyday. (Her dad never had time to buy her clothes growing up, so she just used costumes she found around the shop). Margo says the costumes help her hide behind the characters she has created. I think having the confidence to step out and be different than everyone else, makes her more confident than she gives herself credit for. 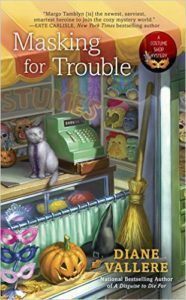 Masking for Trouble is the second book in the “Costume Shop Mystery” series. It is a fun book that keeps you guessing both the mystery, as well as what crazy costume Margo will come up with next. If you are looking for something to put you in the Halloween spirit (and maybe help you think up ideas for your costume or upcoming Halloween Party), this book is sure to entertain, while getting your creative juices flowing. The author has included a super fun giveaway to help get you in the spirit of the season. A Haunted House jigsaw puzzle. Enter to win below. Thank you to Great Escapes Book Tours and Berkley Prime Crime Books for a complimentary copy of this book in exchange for my honest review.